How do I activate user reputation? No activation is necessary. Reputation will appear in the comments view of the Moderation panel for High and Low reputation users. Is reputation unique to my site? Reputation is platform-wide across the entire Disqus network. A user's reputation is the same across all Disqus-powered sites. Reputation cannot be customized and is only visible in the moderation interface of a Disqus admin; it is not publicly visible. High: These are active and up-voted users. Average: This is where everyone starts. Low: These users likely have many flagged and/or deleted comments. You can also see how long your users have been around and how active they are. Why are accounts marked as low reputation? 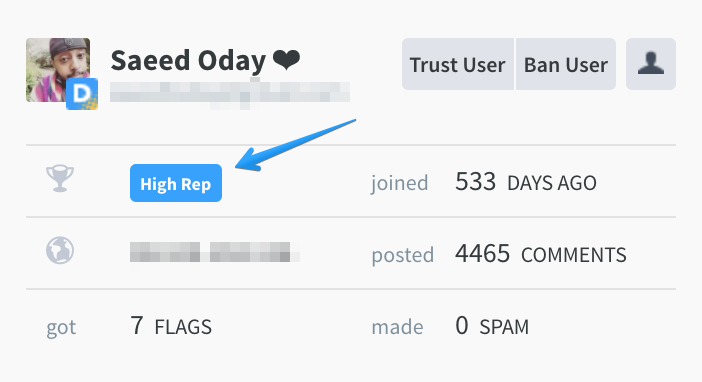 If you want to filter comments by Low Rep users, you can do that. Note that being marked as having low reputation does not affect how that account's comments are treated by our system. For example, comments posted by an account with low reputation are by default no more likely to be marked as spam or pre-moderated than comments posted by an account with average or high reputation. Reputation is only used as a visual indicator within the Disqus moderation interface. Reputation is available via a number of posts and users API endpoints.